It is a critical issue to provide an ANPR system with images of appropriate quality level. Our Ultra Low Lux B/W ANPR cameras provide high resolution and high intensity even in IR ranges for day or night images. To provide optimal conditions for taking an image, an IR illuminator device is included with the ANPR camera. This IR illuminator is built up of low power consumption LED's, and works as a flash. Therefore, the power consumption is only about 10W while the light emission is 2000W. When the IR flashes, the camera takes an image of the passing vehicle's number plate, which will be transmitted through analogue video. As the IR illuminator works at an undetectable rand for human eyes there is no disturbance for drivers. The FXCAM IBW_2000 is an all in one unit including a camera, a 2000 Watts IR flash, IR filter and a synchronizer special designed and optimised for vehicle identification applications. The effective range of the equipment is from 3 meters up to 13 meters, but it may vary, depending on the environment (weather, sunlight, fog, etc.) conditions and the characteristics of the number plates. 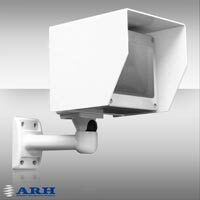 The FXCAM has primarily been designed for ANPR applications (access control). However the FXCAM can be perfectly applied in many other applications where outstanding image quality is needed.